This morning Austin’s WGC released the MDigital Life Social Oncology Project. 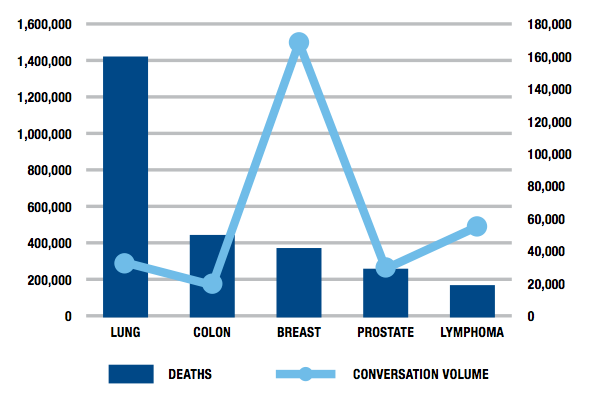 This report represents the deepest look at cancer conversations done to date. If you live or work in proximity of cancer, communication or health, you need to stop what you’re doing and read. The deep dive into #ASCO12 alone is worth the look. Using cancer as the test case, the MDigital Life Social Oncology Project profiles a new model of scientific exchange emerging around disease states. It’s a pattern of exchange with little regard for the mainstream media and traditional academic publishing venues. All of this has me wondering how any physician can ignore the public conversation. Online discussion surrounding cancer is driven by experiences, not data. Breast cancer generates more online discussion than the top four causes of cancer death combined. As medical information increases, expect growing numbers of smaller communities talking about narrow topics at lower volume. Beyond the cancer conversation, WCG and the MDigital Life Project are giving us a deeper understanding of what motivates social health dialog. This project is the work of Brian Reid and his posse at the WCG.